NEW YORK (JTA) – Anthony Bourdain was quick – and often willing – to publicly offer his own flaws. Despite or maybe because of such flaws, Bourdain would stumble into fame, parlaying his latent talent as a writer into hosting three increasingly sophisticated variants of the same food-oriented travel show – first on the Food Network, then on the Travel Channel and finally on CNN. In his professional ascendance, Bourdain developed a unique journalistic voice, demonstrating an underlying, at times seemingly innate ability to acquaint viewers with foreign lands and cultures divergent from their own without mocking his subjects. Instead he humanized the local tapestry of individuals, implicitly encouraging his viewers to do the same. It is for this reason that various communities, including the Jewish community, trusted Bourdain with their respective cultures and heritages – and mourned deeply the news of his death, at 61, on Friday. And yet, still simply happy to be here – happy to have accidentally secured the reverence now attached to his name – he worries not of angering partisans, instead focusing on his task: telling individual stories through food. Over a meal in a Jewish settlement, Bourdain asks a resident about local graffiti reading “Death to Arabs”; the settler admits that it should “probably” be expunged. At the Aida refugee camp outside Bethlehem, he prods a local children’s theater director, asking why communal heroes are armed gunmen, hijackers and suicide bombers rather than TV stars or singers. The director, like the settler, offers a moderate apology, acknowledging that the situation is not healthy. In Israel proper, Bourdain speaks with the Jewish Natan Galkowicz, who lost a daughter in a missile attack from Gaza. The father’s voice underscores the entirety of the episode – mournful over a fraught situation, yet hopeful for peace, not for any particular ideological reason, but in the hopes of a future in which children neither worship armed gunmen nor are killed by missiles and suicide bombs. Although ever ambivalent about politics, Bourdain allows this episode, likely inevitable due to its focus, to become deeply political. Yet he navigates the regional ideological complexities with ease similar to his canoe junket into Borneo’s jungles. Throughout his time on television, Bourdain repeatedly forced his viewers to re-address their own biases. In this particular episode, he renders it difficult for viewers to descend in their own communal extremism. It’s hard to imagine watching the episode without empathizing for both, rather than choosing between, the Palestinians and the Israelis. It is for this reason – his ability, through food, to present on-the-ground, real-life theater in aims of humanizing its players – that Israelis, Palestinians, Colombians, Georgians, Malaysians, Cambodians and Hungarians, among countless others, welcomed Bourdain into not only their locales and cultures but also into their own homes. He did not glorify conflict nor local struggles, but yearned to understand and talk about individuals within their midst. A chef and accidental journalist, Bourdain did the type of reporting that all within the field, particularly in the midst of a global expansion of attacks on the free press, should aim to emulate. His suicide, ominously following news of this week’s CDC report indicating that suicide is rising sharply, shows perhaps how deeply he suffered from his own flaws and contradictions. It was these contradictions, however, that made Bourdain so quick to recognize and respect similar tensions in not only other individuals but in other communities. 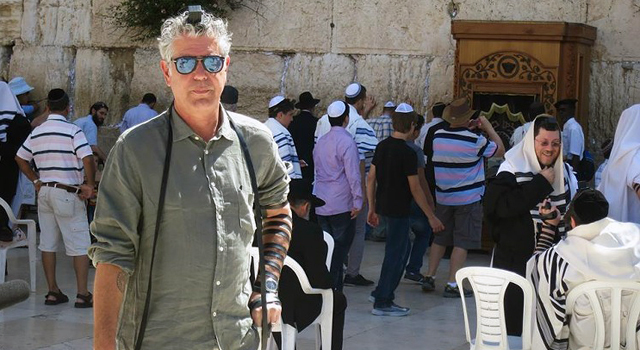 CAP: Anthony Bourdain dons tefillin at the Kotel.